Continuing symptoms: Sore feet, frequent bathroom visits. New symptoms this week: Heartburn. I have had it a few times in the last couple days. 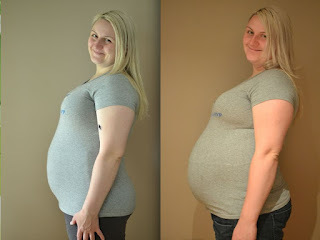 Maternity Clothes: A friend has borrowed me some, so now I have several new pairs of Capris, Shorts and Jeans to use! I also got a couple shirts on sale this weekend. 5 shirts doesn't seem to be enough. Cravings: Nothing specific, but I have very little desire for sweets, which is NOT at all like me. Movement: Love all the movement. I have been feeling spots of pressure this week, like a hand or foot is pressing out. Eric hasn't felt the baby a whole lot, nor has anyone else. It seems like every time someone else tries to feel baby, the movement stops. Baby only likes to move for Mom I guess! I am sure soon enough baby will move for longer periods of time and other people will be able to feel it. Special pregnancy moments: I was up at BCBC this past week, where I counselled last summer. I was reminded of how last year, I cried and prayed for a baby with the female staff at our prayer meetings. Now this year I am in the same place, with a baby kicking around in my belly. It is so overwhelming to me how God works. He is SO faithful. He loves us so much and He DOES hear our prayers. I am incredible thankful for what God has blessed me with. Here is another picture! The first is 20 weeks, and the second is 28 weeks. It makes me giggle how round this belly has become! I love it. No wonder people are touching it!